In the back yard there is a row of pots. I have good luck with them. The pots are on drip feed irrigation, so we can water as needed. The problem with drip feed irrigation is that you end up with clogged sprinkler jets. These sprinklers are the size of a dime and have small holes in it to limit the amount of water that is wasted. Sand often clogs those jets from the ground water that smells slightly of sulfur and iron. Having a sprinkler water a row of pots, each with a 2 gallon per hour flow over a half hour is much more convenient. If I had to go out and water them every day, I doubt they'd be there. Part of my morning routine is that once the sun is up, go out back and look at the plants. I check to see that they're getting watered by something other than my dog, pull weeds, and make sure invasives aren't taking over my little potted garden. It also moves me out of my bouncy chair. Every so often I'm greeted by something that makes me stop and look, a new flower here, a little wildlife there. I've had conversations with parrots and blue jays alike, I'm not proud. Usually though, I'm still waiting for the coffee to kick in and I'm half asleep. Treading lightly over the sea grapes that are in season, staining the concrete by the pool, the light caught my eye. Shimmering in silver and a rainbow of diffraction, there was a gossamer clock face suspended in mid air. We have these little spiders here. They look more like a crab. Non venomous, harmless creatures that I usually experience by walking through their homes after dark on the dog walk. 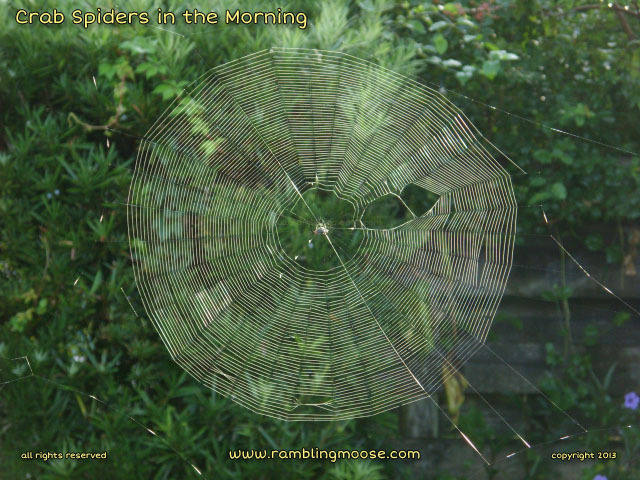 I know that they are there when I hear their webs snap as I move through them. This time I simply stopped to look at the creature who made its home in my yard, looking for a fly-by meal. With all the wildlife here, the crab spider had a lot of food to choose from. An insect smorgasbord behind the bougainvillea. I'm glad it's there. Maybe he'll get rid of my other pets, the mosquitoes. Maybe he'll keep them in check. I doubt it. At least it looked interesting in the morning light.